Jeremy Roenick is a 40-year-old man. He was one of the NHL's best players during one of the NHL's least enjoyable periods. Last night, he cried on national TV. It's really fine that he did. The Chicago Blackhawks won the franchise's first Stanley Cup since 1961 last night. The thing is, Roenick was supposed to have done that 15 years ago. I became a Hawks fan at the tail end of the Roenick era and then watched the team slowly shed everything that made it worthwhile — sending Chelios to the Wings was especially disgusting — and settle into mediocrity. Last night was great. 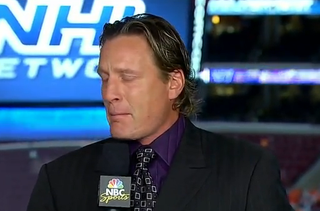 But seeing Jeremy Roenick cry just about broke my heart. Roenick was a bona fide star in the early '90s — probably No. 3 in Chicago's heart after Jordan and Pippen, once the Cubs were nice enough to run Greg Maddux out of town — and his Hawks teams were good. But they were never good enough. They ran into the Gretzky-less but still ridiculous Oilers, and when they finally made it over the hump, they ran into the Penguins with Lemieux and Jagr. In a weird way, those early- to mid-'90s Blackhawks were a lot like those Knicks teams of the same era: perpetually on the cusp. But Roenick? He was something. Then their window closed, and the Red Wings and the Avs took over the league. Roenick got hurt at the end of a contract year. Owner Bill Wirtz had no intention of giving him serious money, what with Tony Amonte waiting in the wings, and J.R. was shipped off into the desert. Sure, he was once again one of the league's best during his stint with the Coyotes and later with the Flyers, but the Cup was always just out his his reach. He looked like he was cooked after single seasons with the Kings and Coyotes, but he held on for two more years with the Sharks, who did what the Sharks always do: not win in May. Roenick finally called it quits and became an announcer, because, really, what else is there for a lifer like him? I was a little stunned when J.R. said he was rooting for the Sharks over the Blackhawks — and that he'd root for the Flyers, too, if it came to that — but I understood. He had given the best years of his life to the Hawks only to get dismissed and Wirtzed out of town after months of trying to get a contract extension. Roenick didn't deserve to toil away and get dicked around by Bill Wirtz. That's not how you treat the face of your franchise, even if he isn't quite Lemieux. Roenick didn't deserve to be swept in his only Stanley Cup Finals appearance. And now he doesn't deserve your derision or mine for pulling a Muskie on live television. Put yourself in his place: The team that you carried on your back for eight years only to get kicked to the curb won a Stanley Cup the year you retired and became a studio analyst, and now Dan Patrick is pointing out that you "didn't get to do that." Your very presence is a reminder of the mediocre past the Blackhawks have now gloriously shed — which is to say, you make people think of Bill Wirtz. Yeah, you'd cry, too. So, to J.R.: You got a raw deal, and it's too bad you never got to hoist the Cup yourself, and it's really too bad you didn't get to do it for the fans who loved you first.